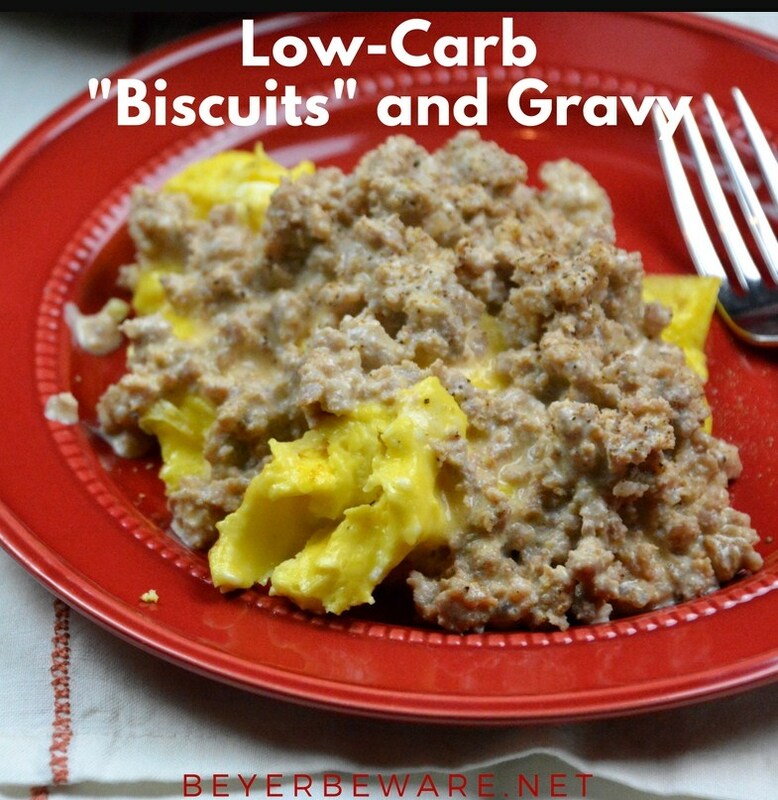 Low-Carb biscuits and gravy are creamy and flavorful. With a bed of fluffy scrambled eggs, the low-carb sausage gravy is satisfying and filling. In a dutch oven, brown ground pork or sausage. If you are using unseasoned ground pork, season with breakfast sausage seasoning. Once meat is completely cooked, add the heavy whipping cream and cream cheese. Stir over medium-high heat till cream cheese is completely melted. Season with additional salt and pepper to your liking. Low-Carb Biscuits aka Fluffy Scrambled Eggs. Scramble the eggs with salt and pepper as well as the milk or water. Melt butter over medium heat in a large skillet with a lid. When butter is melted, pour the eggs into the skillet. Cover. After a minute or two check the eggs. If they are cooked around the edges onto the top, stir. If not, keep cooking. Replace the lid to the pan. Cook for another minute or two. Stir one last time and remove from the heat and cover with a lid. Spoon the eggs onto a plate and the drench in the low-carb sausage gravy.